Therm-a-Rest Proton Blanket. 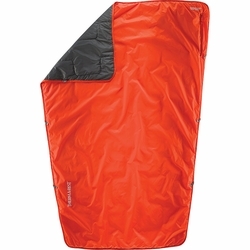 A security blanket for high adventure, the Proton™ Blanket is Therm-a-Rest's most technical and versatile blanket offering the latitude to go from an adventurous, fair-weather bivy blanket, to a deluxe campfire companion. The Proton will keep you charged for adventure knowing you'll be warm and protected with its waterproof, breathable shell, eraLoft™ synthetic insulation designed to provide you with reliable warmth and comfort in a broad range of conditions.